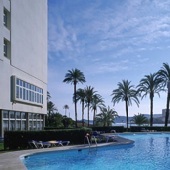 The Javea Parador is located in the beautiful town of Javea /Xabia. Surrounded by the waters of the Mediterranean, it is an ideal location for several water sports. The beautiful garden is home to bougainvillea and other tropical species as well as a magnificent seasonal swimming pool. The interior offers the traveller the opportunity to rest in spacious, comfortable bedrooms with balconies overlooking the sea. The living rooms are spacious, bright and welcoming. Hand-made rugs cover its cream coloured marble floors on which various plants and pots with flowers are placed. The regional restaurant of the Parador serves dishes made from locally caught fish and crustaceans and also the farming products of the area. There is also a spacial menu those on a gluten free diet. In Javea, there are beautiful churches like San Bartolomeu and Santa Maria de Loreto, the Monastery of Nuestra Senora de los Angeles, together with the Ethnographic Museum, and the Plana Mills. Enjoy the Mediterranean traditions of Javea by visiting the San Juan Fires (June 18), the Feast of Virgen de Loreto (September 1), and ”Moros y Cristianos” Feast (September 8). Visit the wonderful beaches of Javea, Denia, Calpe and Benidorm. They are perfect for swimming, scuba diving, windsurfing or yachting. You may also go for an excursion to the capes of San Antonio, la Nao, or to the Rock of Ifach where you will see very impressive scenery. The lookouts of Javea are 12 vantage points to observe the sea starting at Los Molinos in the Montgo foothills. Travelling North to South will find the Cape of Sant Antoni, Punta de l‘Arenal, Sequia de la Noria, Cala Blanca, Portixol, Falzia, cape Negre, cape la Nao, les Pesqueres, Ambolo, and the spectacular Granadella. 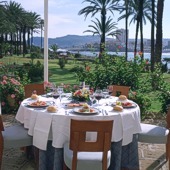 The Parador of Javea has seventy twin bedded rooms. All the rooms have private bathrooms and also a telephone, satellite television, safe and a mini bar. The Parador Javea has air conditioning and central heating, currency exchange, lift, garage and parking facilities (without security and limited places), satellite TV, piped music, gift shop, gymnasium and sauna, garden, seasonal swimming pool, restaurant and bar. Facilities are available to hold business meetings. Distance from the nearest airport is approximately 120 kms, train station is 45 kms away and the nearest port is 12 kms away. We stayed at the Parador for the second time in June, having had a wonderful time the year before. The location is superb; all the rooms have a marvellous view over the sparkling waters and the lovely bay. The gardens are pretty and the pool very inviting. Just one gripe here- it didn`t open until 11a.m. which was very late for most of us waiting to use it. Breakfast was very good; I even managed to make my requests for boiled eggs work as the staff were very helpful. The restaurants within walking distance are so good we never ate in at night but it all added to a most relaxing holiday. I was surprised to find tea and coffee making facilities in the room, but not that they weren`t replenished. It`s not common in Spain, but the bar staff willingly gave us milk and coffee for our room tray every day.Reception staff were really nice and helpful and the room was always spotless too. Just the holiday we wanted. Having visited on numerous occasions over the years for meals, we decided to go for a short stay. It was a wonderful experience and we will certainly return for a longer visit. The hotel generally is very comfortable and the bedroom was excellent. The staff were very friendly and willing to help, even helping my husband with his attempt at Spanish! We would not hesitate to recommend this hotel to anyone. we had a fantastic time in the paradores of javea and mojacar. Javea situated close to to a beautiful beach and boulevard and Mojacar with wonderful paradoresgrounds and lovely dinners. We spent a lovely week at the Parador Javea in June. Bedroom was large as was bathroom, beautiful views from balcony overlooking the superb gardens. Room cleaned very thoroughly each day. Only complaint tea and coffee in room on arrival but then the dirty tray not taken away all week and no more supplies arrived so we're not able to a cup of coffee in room. Asked a couple of times if something could be done but to no avail.Breakfast each morning on terrace again was lovely. A couple of the staff appeared surly for the first couple of days and could not be bothered to smile but then all seemed to improve when a particular gentleman took charge over breakfast. The position of hotel is excellent, only a few minutes stroll from beach shops and restaurants. We would definitely return for another holiday there with no hesitation. 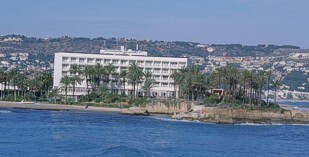 Parador hotel of Javea overlooks the sea at the northern end of the Costa Blanca Spain.